Well as you might imagine this is not really a post I wanted to have to write anytime soon. I had to travel for work in January and I was a little bit worried about him before I left. But there was nothing obviously wrong with him. And he seemed ok when I got back. A couple of days later he wouldn't lift his head up so I took him to my regular vet. She thought that it might have been pain related (a reasonable assumption with his spinal arthritis) and gave me some prednisone for him. He had his regular chiro appointment scheduled for the following day and she thought that was a good idea. Took him to see Dr Linda on Tuesday and what was supposed to be just a chiropractic appointment turned into another full fledged exam. Dr Linda is one of the most intuitive vets I have known. She did not like the was his pulses felt compared with how hard his heart seemed to be working. She didn't think the lifting his head was really pain related though it was hard to tell with the prednisone on board. She recommended I take him back to my regular vet and get a chest x-ray. Took him back down to my regular vets office even though my regular vet wasn't working that day. An ultrasound showed a tumor in Keegan's heart. :-( They said it could be weeks or it could be months before I would have to make any decisions. What was really freaky was his diagnosis was on the day that I lost Logan two years ago. Unfortunately it was only a week before I made the decision to let him go. He had stopped eating and really couldn't move without help. When he didn't even wag his tail when my dad came to visit I knew that it was time to let him say goodbye. I think both my vet's were almost as upset as I was on that day. I will be forever grateful to have had vets that care so deeply about my dogs. And the support staff from the receptionists to the to the vet tech's were great. Keegan taught me way more than I ever thought I wanted to know about dog behavior and brought me several close friends that I will always be thankful for. I will be forever grateful for the things he brought into my life. I know he touched many lives in his travels and he will be missed by many of my friends as well. Here he is at a nosework trial last September doing his container search. He loved nosework and I am so glad that he was able to have something to do after Logan died. And some video .... This is of an interior search early last year. I'm going to miss my boy - but I know he has many friends at the bridge to keep him company. Steeler here. Mom has been a very bad blogger so I decided to step in and at least give everyone an update on what we have been up too. I'll start with the big news ..... I have a baby sister!!!! I wasn't really sure about her to begin with but Mom is always telling me how happy she is that Indie and I are friends. Mom says Indie is a Labrador and that she will only be with us for a couple of years before she goes to live with someone else. 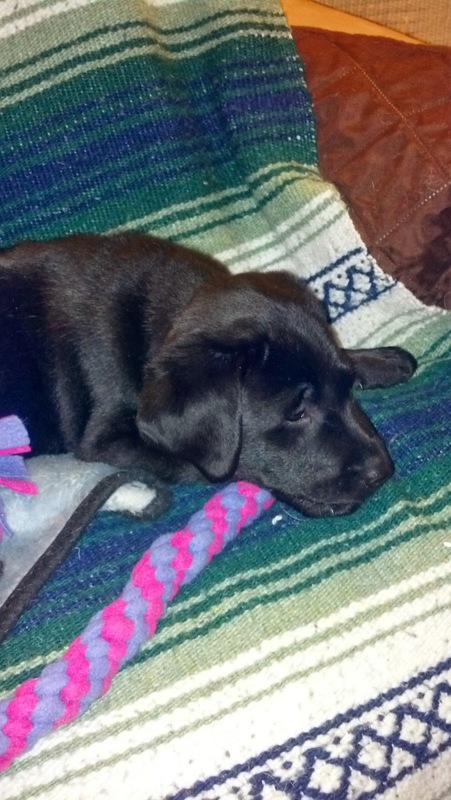 She is hopefully going to be a service dog for someone with multiple sclerosis. Indie came home in February - so she is almost 10 months old already. Now for the really important stuff - ME!!!! Mom and I took a break from obedience stuff for a long time. Especially after Indie came. She didn't know anything so she needed a lot of training time. I continued to have fun in my agility class and we've also been doing some nosework and tracking. Tracking made me really itchy this summer - so we haven't done too much of that recently. But I am so smart that I decided to combine nosework and tracking .... I can find odor by following our teacher's footsteps!!!! Mom wasn't as impressed as I thought she would be and she and Michele started throwing tins around so I couldn't track them. I also went back to the obedience ring last month! I finished my beginner novice title at the end of September with a second place! I also stepped back into the rally ring (now it is WCR instead of APDT) and Mom has decided we can play around with that again. I did my very first level 3 run in September at a trial near home and I must have done really well cause Mom was really happy and I got a blue ribbon!!!! We have another WCR trial coming up in November. Mom may even let me do agility sometime soon. I've been doing really well in class with distractions! Mom has trouble keeping up with me so we are working a lot on distance work while Mom tries to figure out what is going on with her breathing problems! I guess I could also update you on Keegan ..... He is doing pretty well for almost 14 years old - he'll be 14 in February! He can be a little bit cranky these days, he really doesn't want to play too much any more. He played with Indie when she first came but now she is too big and too rambunctious - at least that is what Mom says. Keegan has been to two nosework trials with Mom. He did pretty well in both - passed 3 of 4 elements. He really likes doing nosework but he gets tired with these all day affairs. Mom says she may try one more trial with him if there are any close to home next year if he seems to be doing well. But I may get to go to a nosework trial next year too! So that's the basic update! Now I need to go check on my other spotty friends on the web! August Already???? Where did the summer go? I can't believe it is August already! Time just seems to be going by so fast these days. Steeler and I have been taking a bit of a break from dog activities lately. After a trial in early May where our runs were not so pretty - I discovered Steeler had a shoulder injury. In late April he took a hard fall while we were playing with the frisbee, and in typical Steeler fashion, he jumped right up and wanted to chase that frisbee again. So I didn't think too much of it. A week later, our obedience runs were very disconnected and I felt like everything was falling apart. A friend asked me when he had last been checked by a chiropractor. (Insert head slapping moment here!) DUH! So down to Dr. Linda we went. Sure enough his right shoulder was very very sore still 3 weeks after his tumble. So he got some adjustments and some laser treatment and was told no jumping for at least a couple of weeks. I decided that with the stress I was feeling about competing and Steeler not feeling up to par - that it would be a good time to take a break from things for a while. And since I can't just stop doing something dog related (or I would have a very bored dog looking for trouble) I decided that Keegan and Steeler should have a night out doing noseworks. Luckily there was a class starting just 15 minutes from my house! Talk about the timing being right. 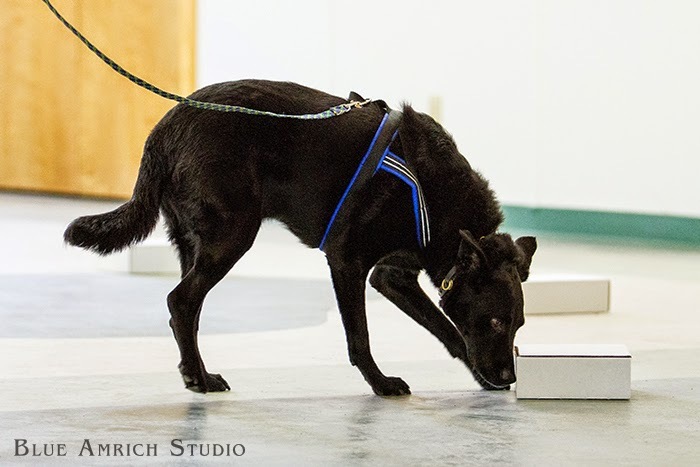 Steeler has had some exposure to nosework before - so he went right back to workng without any problems. He absolutely LOVES this sport. I really think he would do this for hours on end if I let him. The only part we are struggling with is being quiet when I work with Keegan. Keegan is also liking this new activity. In typical lab fashion - if it involves food he is happy. When we introduced him to birch - he wasn't too thrilled with the scent, but he seems to be doing pretty well now. This week he was actually eating out of the bowl where the odor was instead of wrinkling up his nose and waiting for me to pick up the food for him! Keegan is 12.5 years old now, so he has days where he looks a bit stiff. But he still acts like a puppy if you say the magic word .... "walk"
In addition to the nosework class, Steeler is still doing some obedience lessons and we are starting to work on utility articles. We are just starting - but so far he is doing great. In fact I made him a new bag for his articles! So we are still doing stuff - just not as much running around every night. Steeler and I spent the weekend at the Denise Fenzi Seminar. I am EXHAUSTED! But so excited to try some new things with Steeler. There are a few people that I would always go see - even if I had seen them a few months ago, because I think I could walk away with something new every time. Kathy Sdao is one, Patricia McConnell is another ... and definitely Denise Fenzi has been added to that list! If you ever get a chance to see her - GO!!! It is well worth the time and money. More to follow later - I am working on getting my notes on the computer so that I will be able to actually read them again when I want to go back and look at things. I will try to get a review up ... unlike the review for the Kathy Sdao seminar that I did last summer that is still in edit mode! She was incredible too! I need more usable hours in my day. After 4 to 6 weeks of feeling just BLAH both on my part and Steeler's - we are finally getting back into training mode. The boys are both adjusting to Logan's absence and we are all starting to recover. Tonight Keegan played a little bit with Steeler while throwing the frisbee out back. Keegan went through a period where he didn't want to be left alone and didn't want to be in the house even when we were home. Poor Keeg! His entire life, Logan has been there. We did everything together back then, agility, walks in the woods, trips to where ever. At any rate, I feel that Keegan is on the mend. Steeler has been getting back into the swing of things as well. We competed in another CDSP trial up at the Monadnock Humane Society, and while his runs were nice - they didn't have much enthusiasm. Watch the videos and see what you think. Following our training session Steeler and I went down for obedience run thru's. We had two rally runs and one Novice run. Steeler did awesome - despite the fact that I was a nervous wreck because there were a ton of people there. I did get to see some friends I don't see often - so that was a nice bonus! My sweet little girl lost her battle tonight. She's had a rough couple of months. I am not sure what she was battling, but it doesn't matter now. Now she can run pain free and breath easy. She was my first dog, and of course I got her for all the wrong reasons. We went to the shelter just to "look." I had just been laid off, so obviously it was a perfect time to get a dog. She was all alone in her kennel and she was just so cute that I couldn't resist her. She and her littermates had been dumped at the animal shelter because they had come down with coccidia. Logan taught me about dogs in general and what owning a dalmatian was all about. We started a general pet obedience class together and soon moved on to agility. She was never an agility superstar - she did agility because she enjoyed being with me. Her favorite course was USDAA Jumpers! She could really fly when she wanted to - and even better no weave poles in jumpers! She always did try to entertain the crowd a little though. She loved to run in the woods, and never met a dog she couldn't play with. She alway knew just what to do if a dog was scared or nervous about meeting other dogs. She especially loved the big dogs! We used to run into a guy walking his great dane - oh it was so entertaining to watch them play! As a TDI test dog she had to be told that she couldn't flirt with the other dogs while doing the test. She was supposed to be a neutral dog! She loved almost everyone - the couple of times that I remember she didn't like a person, I heeded her wisdom - especially since this usually happened in the woods while I was walking with her, Keegan and Puka alone. If I stare at this piece of cheese hard enough - someone will give it to me! Because of Logan I have friends I never would have met otherwise. I will miss you my sweet little girl. It's hard to believe - but my puppy is 6 years old today! I'm not really sure where the years went! I think having a birthday is a good excuse to post some puppy pictures!!! 4 months - playing with Luke.